I just spent a tiring, yet delightful, afternoon working on Kent County’s newest Community Garden. 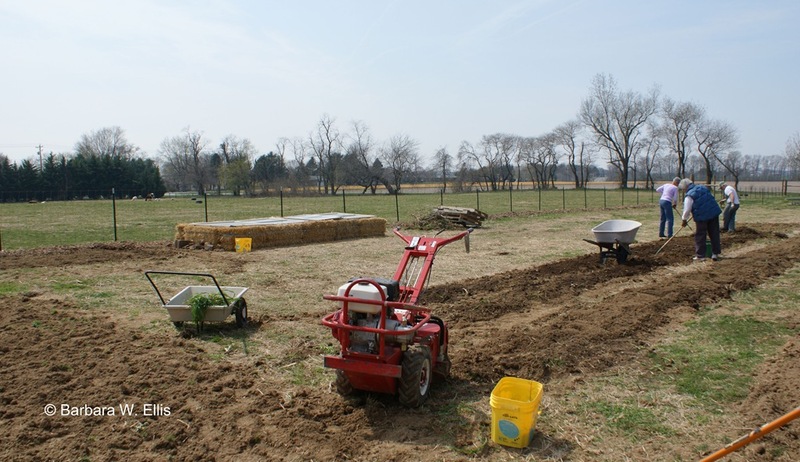 A little over a week ago, the garden was simply a fenced field on the north side of a sheep pasture at Victory Farm, located just outside Chestertown. Today, we have a straw-bale cold frame planted with lettuce, spinach, and mesclun (all sewn about 10 days ago), plus tilled beds and amended soil ready for warm-season crops to come. We also have mulched fence lines that will reduce the need to trim, a herb garden, a swing set ready to support sugar snap peas, and room for growing perennials to offer for sale at Master Gardener and other charity plant sales. ABOVE: Preparing the main beds in the garden. The plan is to grow some produce for ourselves, but to donate most of what we produce to needy area families . The garden got its start when my friends Sarah Ruckelshaus and Lynn Wait started talking about organizing a community garden. Sarah generously offered land at her farm, and Lynn, a newly minted Master Gardener, had enthusiasm to spare. I liked the idea from the start, too, since I don’t have a great site for a vegetable garden at my place. While we could still use more hands to help plant and tend, Sarah, Lynn, and I, together with enthusiastic volunteers John Leek, Carolyne Grotsky, and Heather Ransom, have accomplished the aforementioned transformation. We’re all tired and a bit sore today, but we’re also excited about what the season will bring. ABOVE: Great volunteers are the best! My involvement in the Victory Farm Community Garden stems from a pet project I’ve talked about before: Plant a Row for the Hungry (PAR). 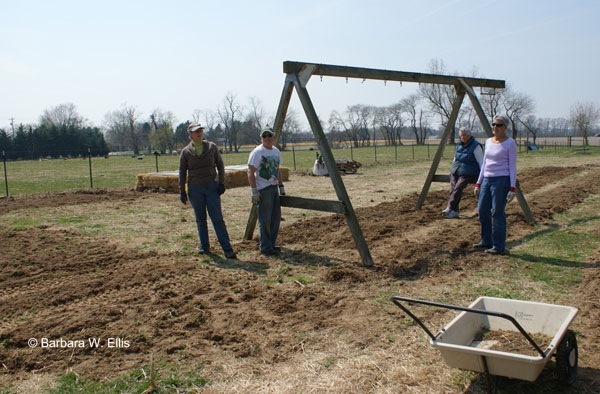 Plant a Row is a national program begun by the Garden Writers Association. It encourages gardeners to plant an extra row—or just a few extra plants—and then share their bounty with needy families. In Kent County, the majority of our donations go to the Chestertown Food Pantry. If you have a home garden, I hope you’ll consider planting an extra row, and then sharing the extra produce. You can deliver produce to the Chestertown Food Pantry on Tuesday or Thursday mornings at 10:00 a.m. If you have food to donate, keep in mind that I am always happy to pick it up and deliver it for you. Just drop me an e-mail at hackberrypoint@gmail.com or call me at 410-778-6107 and I can make arrangements to get your produce to someone who really needs it. The Victory Farm Community Garden is just getting started. If you would like to join our hard-working yet fun group, we’d love to have you! (Did I mention we have a park bench and a stainless steel goose-picking table for setting lunches, water and other items?) Future projects include installing strings for our pea crop, building mounds to plant squash and pumpkins, plus weeding, watering, and harvesting. We also need to fence in the one remaining side of the garden and add a gate. All the materials are there, it’s just a matter of getting it done! We also cheerfully accept donations, and we could use good-quality tools (we’re currently transporting tools to the garden each time we go there to work), hoses, large tomato cages in good condition, stakes, and perennials to grow on for the Master Gardeners to sell at plant sales. Perennials, which must be suitable for full sun, must be named and cannot be invasive species. We would also love to get an old, charming looking shed—an old outhouse would be perfect—to use for storing tools. If you have something else you think would be useful, get in touch with me! I’ll keep everyone posted on how the garden progresses this summer. I hope some of you decide to come and help us out! It’s going to be great, I think. We are still figuring out what else we’ll grow. I know potatoes and sweet potatoes are on the list. Plus, we’re planning to put in some planting mounds to grow pumpkins, gourds, melons, and winter squash.